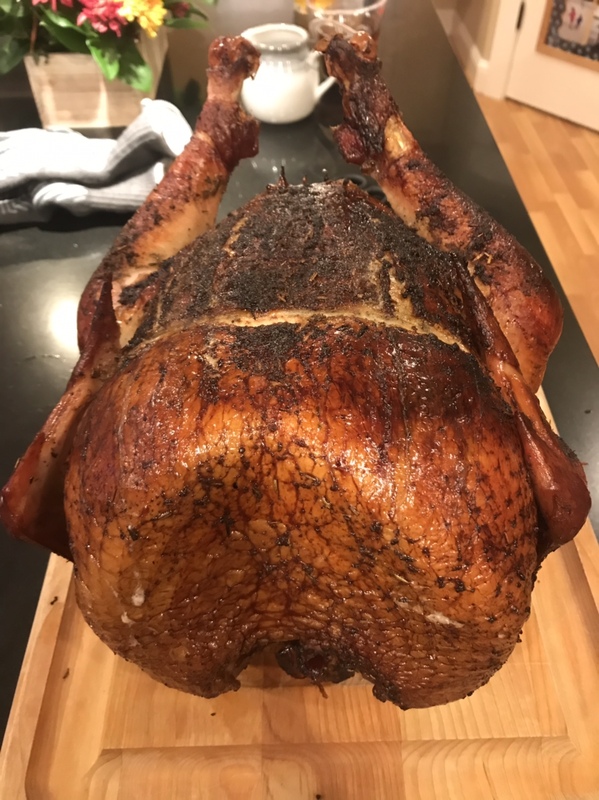 Been sometime since I posted, so thought I would put up a post of my holiday Turkey. I followed the same program that I have done in the past. I brined in food safe 5 gallon bucket for 22 hours (22lb Turkey). The brine consisted of water, vegetable broth, salt, brown sugar, apples, onions, rosemary, thyme, and garlic. Removed from brine the night before, patted dry, rubbed with a little bit of peanut oil inside skin and out. Applied a Rosemary and Thyme rub under skin of breast and outside of skin. Then put the bird in the fridge uncovered over night. The next stay I pre-heated Bradley to 250 and pulled out Turkey and put on counter to come up to temp. After 1 hr, I put the bird in the Bradley and ran apple for 4 hours at 250. After the 4 hrs I pulled out the bird and put in the SRG on high with lid up. (it had been pre-heated) The bird took just over 1 hr to reach 160 in the breast, so total cook time of 5 hours. I pulled the bird and put it on my cutting board and lightly covered with foil to let it rest of about 30-40 minutes, then carved it. I only got a pic of it after coming out of SRG, no shots of it carved up. Looks really good. Nice job.